Find out the platform's features through the testimonies of users on their daily uses of our services. 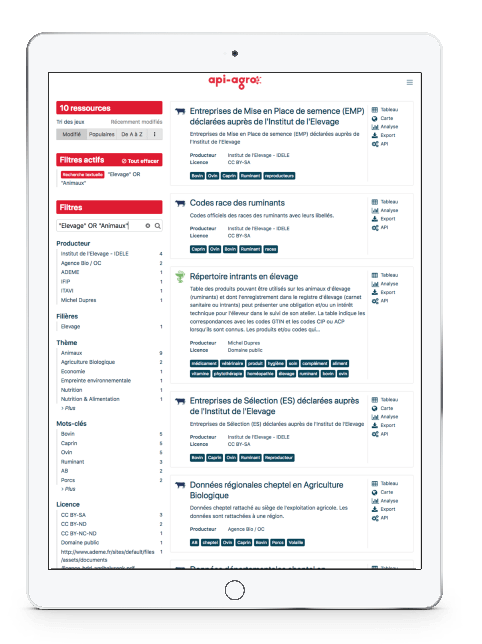 The requirement : Finding and acquiring reference data to assist users of AGROPTIMA, a field management application, in entering details of their operations. The requirement : Disseminating agricultural datasets and accelerating their exploitation. Data has become an essential component of your business. Exploit its value to the maximum! Your data and algorithms are a resource for adding value. By joining the API-AGRO platform, disseminate your data safely, while controlling their destination and use. Develop innovative digital services in total security! API-AGRO provides an open catalogue of raw or aggregated data, supports you in their use, and offers advice on the expectations of agricultural sector actors in order to design innovative solutions. When it’s useful, your data becomes valuable. API-AGRO connects you with all the actors in all agricultural sectors by giving you access to its network of data collectors and digital solution publishers. API-AGRO promotes the sharing of data and algorithms in total security. The project brings together, in a benchmark marketplace, numerous partners and clients in relationships of trust. API-AGRO meets the innovation needs of all crop and animal value chains. A secure platform for sharing data and APIs is strategic in enabling farmers to adapt to changing markets and to stay competitive. Actors invested in the agricultural ecosystem, API-AGRO’s shareholders represent thousands of stakeholders in the sector in France and beyond. Learn about all the datasets and APIs available, search by theme, export datasets of interest, make or view advanced charts and diagrams etc. to support agricultural sector actors in their exploitation of data. An initiative from the world of agriculture, API-AGRO aims to interconnect and bring together public and private actors, around an independent technological platform, and to develop innovations with the vision of high-performance, responsible agriculture.